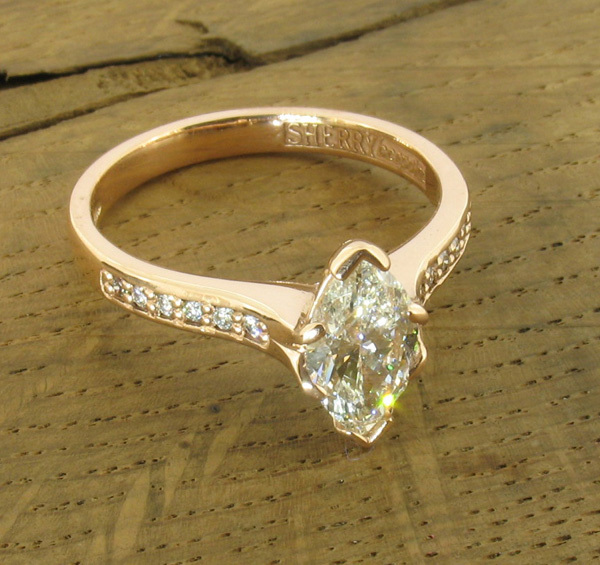 Red gold marquise cut diamond bespoke engagement ring. A new ring, designed and made as a unique one-off for a commissioning client. This ring carried the SHERRYbespoke label, to show it is a copyright ring, created as an original design. The client chose the diamond from a selection of loose marquise cut diamonds that we offered her. She wanted a graceful shape for this 1ct + diamond, yet she wanted the ring to be worn tucked up against the forthcoming wedding ring. We achieved this with a sweeping swan neck shape, which is becoming one of our trademark shapes. Securely set, the small diamonds in the shoulders add extra embellishment to this stunning ring.